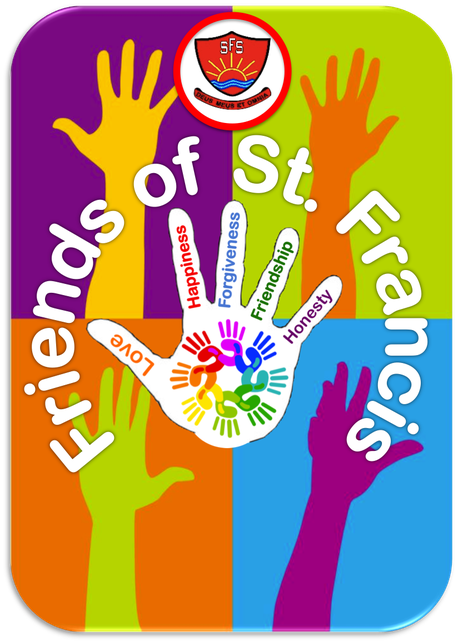 Friends of St.Francis are the parent teacher association of St.Francis Aided Primary School and Nursery. It is a registered charity (membership number 1115657) and acts as the focal point for identification and coordination of work designed to raise additional funds for the school. This enables the purchase of or contributions to specific items that the school has identified as beneficial to the pupils experience and growth at the school but which can’t be funded from normal school budgets. As a parent you are automatically part of the Friends community and are welcome to support and contribute to their activities as much as you are able to. Friends organises several major fund raising events throughout the school year (Christmas and Summer Fayres), some social events (Quiz Night) and regular cake and used uniform sales. They also provide support for various school events such as discos and Year Six Performances. These have raised funds for the school that in the recent past have been used to purchase:- Playground markings, kindles, trim trail, library books, football team kit…..
Friends have a management committee that is elected at the Annual General Meeting, which is held in September/October at the beginning of each school year and has regular meetings every half term which are advertised in the school newsletter. The school website will be used to publish and promote any material arising from Friends activities to the give the widest possible audience to the efforts and activities undertaken to support the school through this body.